Up front, this is a stir-fry dish in the style of Pad Thai. It is a matter of ingredients. 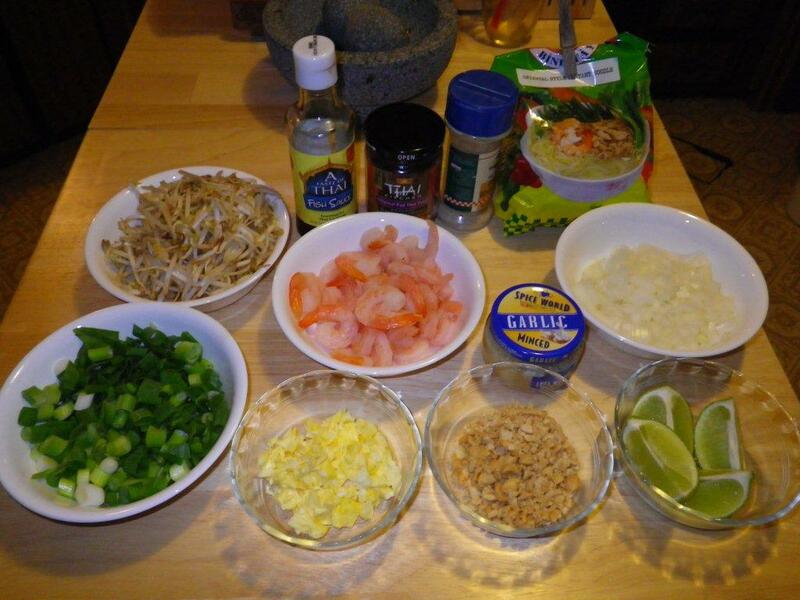 The local supermarkets do not carry all of the items needed to make an “authentic” Pad Thai. I have had to make some substitutions. From time to time I come across a source and stock up on a few more authentic items. But for the most part the recipe as given here is as I would make it from the local supermarket. How close is it? Over the years I have had Pad Thai from several different vendors. All were identifiable as Pad Thai and yet all were slightly different. I think if I slipped a bowl of this Pad Thai among the others, it would be accepted as easily as the others. There is one ingredient, available in most asian markets, you need for Thai cooking, that is nam pla, or fish sauce. A pungent sauce, it thankfully looses its aroma when added to the cooking food, but it imparts a particular flavor needed for Thai-style dishes. Soy sauce is a poor substitution. 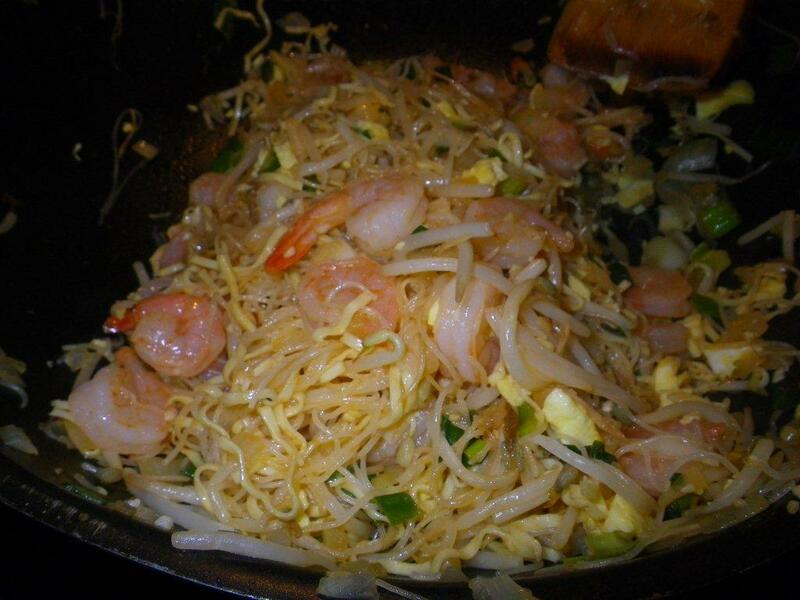 I like the shrimp Pad Thai, Other mild-flavored fish or shell fish as well as chicken can be substituted. You can omit the shrimp and fish sauce altogether, substitute soy sauce and use tofu to make it a tasty vegetarian dish. Remember, this dish contains peanuts and can cause a serious allergic reaction. 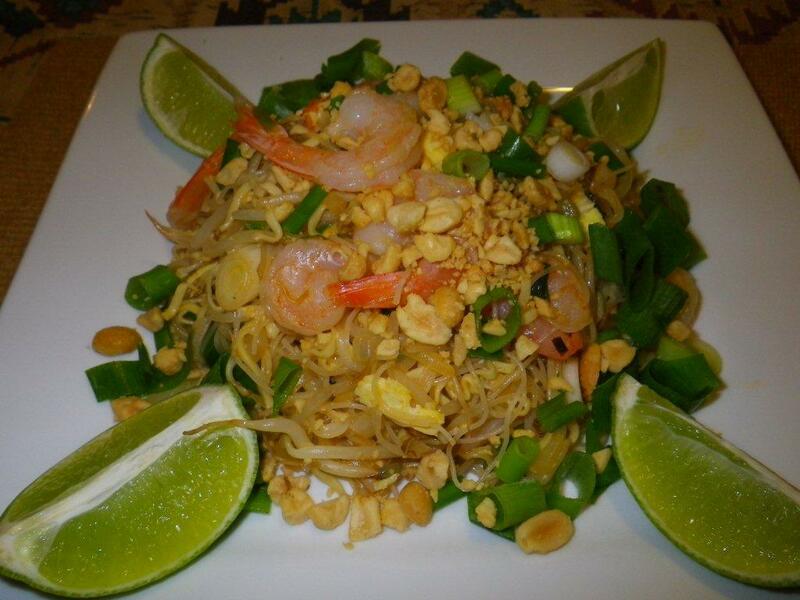 In collecting recipes over the years I have come across several variations and have added them at the bottom of the ingredients list as optional, possible additions to your Pad Thai dish should you choose. In a small Teflon fry pan, melt a dab of butter. Add egg and fry scrambled. When still soft remove from heat and set aside (most prefer to scramble the egg in the wok with the rest of the ingredients but I prefer to add the already scrambled egg to the nearly completed dish; your choice). Prepare the noodles. 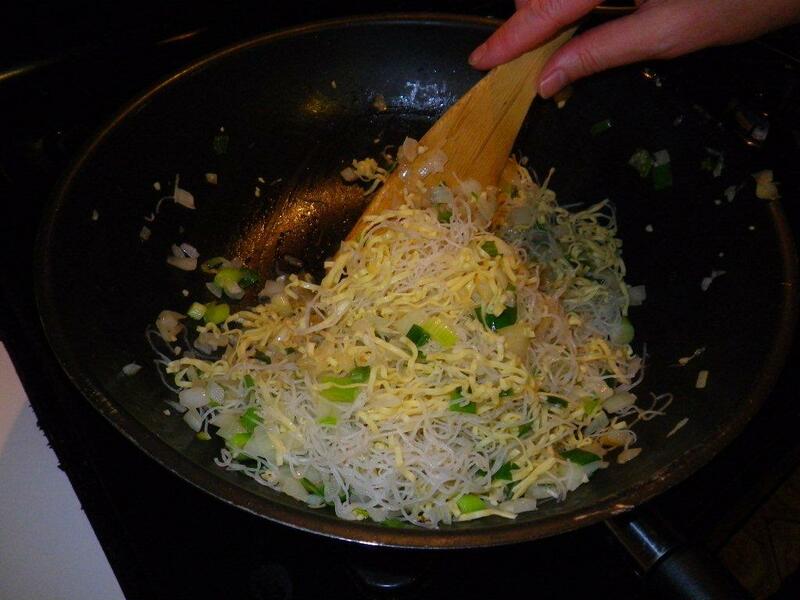 Unlike wheat noodles, the rice noodles only need to soak in warm, not quite hot water. It takes about 10 minutes, but do not over soak. If the noodles become soggy, spread on a paper towel for awhile to dry and firm. Slice green onions including most of the green stems. The green onions substitute for Chinese chives. Reserve 1/4 cup of the onion slices for garnish. Rinse and drain the bean sprouts. Peel and fine-dice yellow onion. Drain noodles. Preheat wok on high heat and add oil. Add chopped peanuts and stir fry until lightly browned. Remove from pan and set aside. Add onion and stir fry for 1 minute. Add garlic and green onions. Stir fry for 2 minutes. Add drained noodles (should be soft but not soggy) and stir fry to mix for 1 minute. Add tamarind, sugar and fish sauce. Stir and fry to combine for 1 minute. Add chili pepper and bean sprouts. Stir fry for 1 minute. 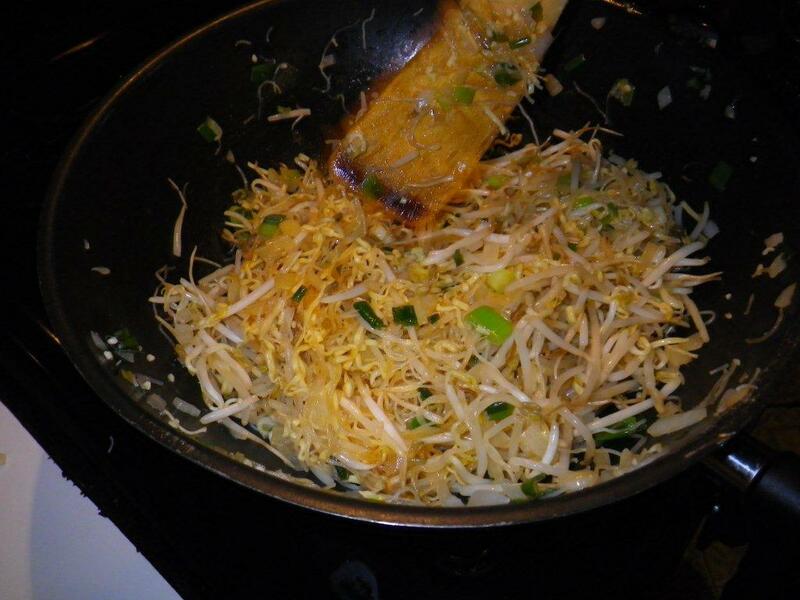 Add bean sprouts and stir fry for another 2 minutes. If there is liquid in the pan, stir fry until liquid has evaporated. Use spatula to dice up previously scrambled egg. 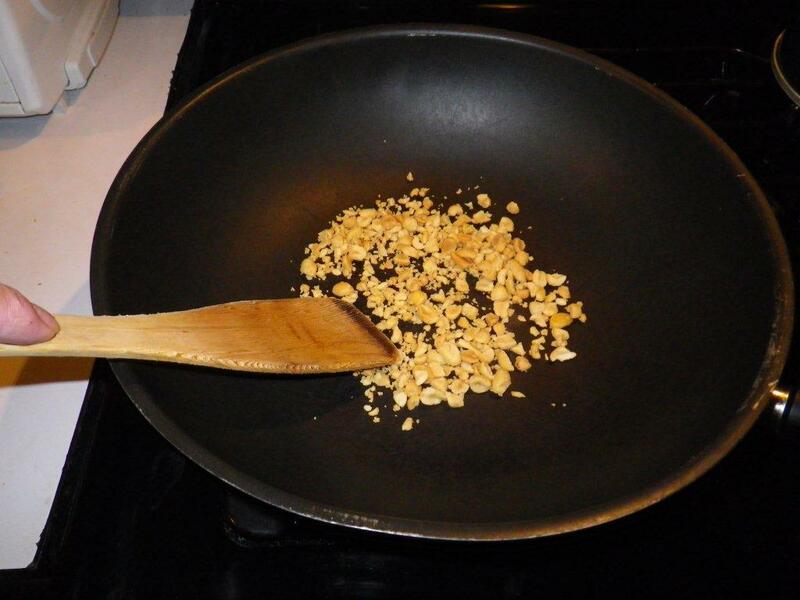 Add egg to wok. Add shrimp and stir fry to mix and heat through. Turn out onto serving dish. Garnish with reserved peanuts and green onions. Serve with lime wedges if desired.